* Cross Drove, Hockwold, Norfolk. Sat, 30. Stewart Bracey (Shimano Dynamite Baits) 68-1-0, F1s to 5 lb, skimmers & brown goldfish to 3 lb, 14.5m, pellet and worm, peg 67; Dave Reeve(Daiwa Angling Direct) 65-10-0; Neil Parkinson (Dynamite Middy) 50-14-0; Steve Kindleysides (Cross Drove) 50-5-0. 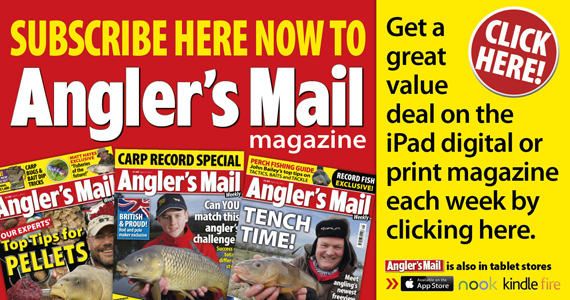 * Fish for 5 +5k Qualifiers, Water Meadows Fishery, Chapel St. Leonards, Lincs. Sat, 32, Moat Lake. Ian Bowden (Water Meadows) 86-4-0, carp to 6 lb, barbel to 4 lb, poled dead red maggot, peg 40; Steve Blankley (Water Meadows) 83-15-0; Colin Spencer (GOT Baits) 77-13-0; Dave Gibbs (Water Meadows) 63-14-0; Ashley Pimperton (Water Meadows Fishery) 55-10-0. Sun. 32. Lloyd Lakin (Saltfleetby) 99-11-0, carp to 6 lb, barbel to 4 lb, pole fished dead red maggot, peg 38; Pete Bell (Water Meadows) 81-12-0; Ernie Waterfall (Water Meadows) 77-0-0; Nathan Underwood (Saltfleetby) 71-0-0; Steve Lane (Marukyu) 64-2-0. * King of the Fens, North Level Drain, Tydd Gote, Cambs. Sun, 59. John Bates (Sensas Mark One White) 47-9-0, four bream for 20 lb to waggler and worm, decent skimmers to feeder and worm, peg 15; Andy Ellis (Oddballs) 43-10-0; Simon Colclough (Maver Image) 36-15-0; Lindsay Naylor (Browning Hot Rods) 28-8-0; Alan Lemmon (Sensas Mark One Black) 21-1-0. Teams: Garbolino Black Horse 58; Sensas Mark One White 52; Oddballs 49; Maver Image 47; Garbolino Lincs County 46; Browning Hot Rods 45. League: Sensas Mark One White 3; Garbolino Black Horse and Browning Hot Rods both 8; Maver Image 10; Maver Bait-Tech and Oddballs both 11. * Nisa Feeders, River Yare, Beauchamp Arms. Sat, 64. Mark Haverson (Daiwa Angling Direct) 31-8-0, bream to 4 lb, groundbait feeder, worm and fluoro gozzer ,bream to 4 lb, peg 62; Will Freeman (Preston Innovations) 16-12-0; Simon Hailey (Daiwa Angling Direct) 16-10-0; Doug Botley (Daiwa Angling Direct) 13-9-0; Mike Brown (Norwich & District) 13-6-0; Kevin Rowles (Devizes MG) 11-5-0. 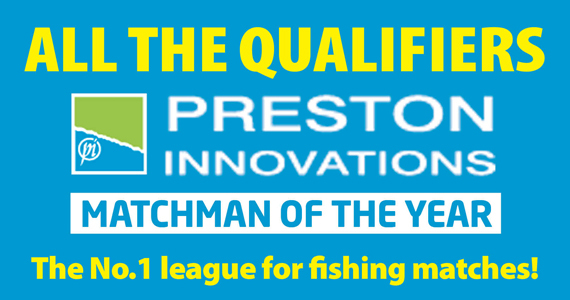 * Preston Innovations East of England Feeder Championships, River Yare, Beauchamp Arms. Sun, 61. Kevin Rowles (Devizes MG)12-6-0, 4 lb of small skimmers to feeder plus roach and perch down edge on small feeder and bomb, peg 26; James Carty (Devizes MG) 11-12-0; Steve Clarke (Maver Image) 10-8-0; Glen Hubbard (Daiwa Angling Direct) 9-6-0; Craig Ablett (Ipswich) 7-14-0; Kevin Paynter (PW Angling) 7-10-0. Chestnut Pool, Langford, Bedfordshire, Sun. 15. Amer Jawad (Daiwa) 79-8-0, 30 lb of roach and nearly 50 lb skimmers, meat shallow, peg 4; Dave Henegan (Chestnut Pool) 66-7-0; Andy Dilley (Chestnut Pool) 64-6-0. Cobbleacre Lakes, near Norwich. Tues, 10. Barry Coe (Busmen) 36-3-0, Adams lake; Steve Rouse (Martham) 32-14-0; Jim Randell (Sensas) 30-10-0. Sat, 10. Craig Gladding (Rhino) 50-1-0, Amy’s lake; Steve Rouse (Martham) 46-12-0; Mick Harman (Martham) 18-1-0. Cross Drove, Hockwold, Norfolk. Wed, 23. Ian Shipp (Cross Drove) 87-12-0, carp to 20 lb, F1s to 6 lb, 14.5m, corn & meat, peg 17; James Heaps (Poplett’s) 68-11-0; Rodney Finch (Deben) 68-2-0; Glen Burden (Cross Drove) 59-6-0; Rob Heath (Chestnut Pool) 56-4-0. Sun, 20. Martin Woods (Emneth) 101-8-0, carp to 12 lb, F1s to 5 lb, 13m, catmeat & corn, peg 5; Hilton Kemp (Cross Drove) 78-4-0; Mark Pollard (Shimano Stanjays) 73-14-0; Tony Watling (Fox Match) 73-2-0; Chris Vandervielt (Bowlers Bait-Tech) 69-12-0. Deeping St. James AC, South Holland Cup, Round One, Sun. Westwood Lakes, Wyberton, Boston, Lincolnshire, Skylark Lake, 11. Brian Ogden ( Deeping St. James AC) 58-8-0, 50 lb of barbel plus a few carp, poled meat, peg 8; Ray Torrington (Deeping St. James AC) 46-9-0; Hugh Mannall (Deeping St. James AC) 45-13-0. Decoy, Whittlesey, Cambs. Tues, 21, Beastie Pool, Nigel Baxter (Bag’em) 164-15-0, carp to 6 lb, pellet, peg 5; Tony Dawson (Bait-Tech) 148-2-0; Stewart Bracey (Bait-Tech) 124-9-0; Tom Neal (Rutlanders) 100-0-0. Sat, 26, Oak Channel. Tony Dawson (Bait-Tech) 125-6-0, small carp, poled pellet, peg 22; Jon Whincup (Bait-Tech) 123-11-0; Martin Freeman (Marukyu) 117-12-0; Simon Godfrey (Decoy) 115-6-0. Sun, 16, Willows Pool. Craig Bate (Colmic UK) 180-15-0, carp to 6 lb, poled paste, peg 35; Adam Wayman (Ringers Baits) 151-10-0; Ted Sargent (Decoy) 130-0-0; Simon Godfrey (Octoplus Peterborough) 112-3-0. East Delph, Whittlesey, Cambs. Sun, 16. John Buckenham (East Delph) 90-0-0, carp to 9 lb, feeder and corn, peg 11; Ian Frith (East Delph) 70-0-0; Trevor Haycock (East Delph) 55-0-0. Foston, nr Grantham, Lincs. Wed. 13. Graham Eden (Mansfield) 106-8-0, carp to 10 lb and bream 3 lb, poled dog biscuit and pellet, Hawthorn 28; Dave Booker (Mansfield) 101-0-0; Bob Brown (Newark) 90-0-0; Paul Kimberley (Team Zimba) 80-12-0. Sat, 19. Phil Morris jnr (Notts AA) 138-12-0, carp to 10 lb, poled dog biscuit, Hawthorn 23; Ian Palfreeman (Phil’s Bait and Tackle) 92-4-0; Tim Booker (Mansfield) 85-0-0; Andy Birkin (Phil’s Bait and Tackle) 68-0-0. Garbolino RAF East Midlands League, Mill Dam, Newark, Notts, Tues, 15. Graham Welton (Garbolino RAF/Waddington A) 112-6-0, carp, poled banded pellet, peg 4; Dave Manton (RAF Conninsby) 110-0-0; Ian Ward (Garbolino RAF/Waddington A) 77-0-0; Danny Hurst (Garbolino RAF/Conningsby) 73-4-0; Graham Welsh (RAF Cranwell) 68-12-0; Lee Brackenbury (RAF Waddington A) 67-2-0. Thurs, 16, Westwood Lakes, Lincs. Steve Reid (Garbolino RAF/Wassington A) 110-0-0, mainly barbel plus a few ide, poled maggot, peg 5; Al Dyer (RAF Waddington A) 104-8-0; Spike Milligan (RAF Old Lag) 103-0-0; Craig Brown (Garbolino RAF/Waddington B) 88-8-0; Graham Welton (Garbolino RAF/Waddington A) 87-4-0. Graham’s Pond, Huntington, Cambs, Sat. 12. Stuart Redman (Team Sensas) 13-9-0, carp and silvers, poled pellet and maggot, peg 3; John Hurley (Graham’s Pond) 9-0-0; Tony Watling (Graham’s Pond) 6-6-0. Lakeview, Holwell, Leicestershire. Sun, 33, Serpent, Canal and Stream Pools. Shaun Huggins (Dynamite Baits) 87-10-0, carp and silvers, poled worm, maggot or pellet, Canal 12; Kev Kania (Avanti Used Tackle) 76-13-0; Steve Bentley (Lakeview Select) 62-12-0; Bob Murray (Netbusters) 60-10-0; Ken Daws (Sensas) 58-8-0; Brian Orme (Lakeview Select) 57-7-0. Sat. Veterans, Serpent Pool, 15. John Cook (Lakeview Select) 63-0-0, carp, poled pellet, peg 14; Roger Holmes (Lakeview Select) 60-8-0; Keith Daws (Lakeview Select) 45-4-0; Pete Sisson (Lakeview Select) 40-0-0; Chris Shore (Lakeview Select) 34-0-0; John Deabill (Lakeview Select) 33-0-0. Wed. Veterans, Serpent and Stream Pools, 17. John Cook (Lakeview Select) 63-4-0, carp, poled pellet, peg 20, Serpent Lake; Roger Holmes (Lakeview Select) 64-8-0; Keith Daws (Lakeview Select) 62-2-0; Rob Taylor (Lakeview Select) 53-4-0; Cliff Adcock (Lakeview Select) 47-10-0. Leverington AC, East Delph, Whittlesey, Cambs. Sun, 12. Martin Burggarf (Levrington) 61-0-0, carp to 8 lb and silvers, poled paste, peg 28; Lewis Smith (Levrington) 57-8-0; Terry Chilvers (Levrington) 43-0-0. Long Eaton Fed. Summer League, Erewash Canal , Station Road. Sat. 24. Steve Posiak (Long Eaton Fed) 7-3-0, two tench to worm plus roach, rudd and perch to squatt; Tony Barker (Shakespeare) 6-10-0; Frank Posiak (Kingsway) 4-4-0; Alan Wright (Long Eaton Fed) 3-8-0; Ron Scales (Notts AA) 3-6-8; Will Scully (Post Office) 3-1-0. Market Rasen AA, Willingham Road Lake, Lincs. Thurs, 14. Bud Chambers (Market Rasen AA) 5-0-0, skimmers and roach, poled maggot over caster, peg 26; Barry De’ath (Market Rasen AA) 4-5-0; Brian Sutherland (Market Rasen AA) 4-3-0. Railway Lake, Norwich. 13. Matt Wiles (Attleborough) 114-1-0, small F1s, pellet feeder & banded pellet, peg 46; Paul Ashford (Barford Tackle) 92-13-0; Dave Agass (Stalham) 85-6-0. Sherwood Forest Fishery, Edwinstowe, Nottinghamshire, Wed, 25, Holmedale Lake. Andy Lakey (Worksop Angling Supplies) 105-0-0, 32 carp, method feeder and pellet, peg 19; Matt Malia (Wickersley Angling Centre) 97-11-0; Adam Wakelin (Preston Innovations) 95-8-0; Alan Warren (Phil’s Bait & Tackle) 95-4-0; Gary Hazelwood (Vale AC) 92-8-0. Tues, 11, Sherwood lake. Fred Bispham (Peg One Angling Supplies) 51-10-0, 17 carp to 8 lb, popped-up bread, peg 40; Mark Watts (Sherwood Forest) 49-10-0; Steve Richards (Sherwood Forest) 44-15-0. Sun, 25, Holmedale Lake. Andy Lakey (Worksop Angling Centre) 131-7-0, carp to 10 lb, poled meat, peg 32; Martyn Brown (Eastwood Angling Centre) 97-0-0; Nigel Shipman (Sherwood Forest Fishery) 90-15-0; Matt Malia (Wickersley Angling Centre) 88-12-0; Carl Brown (Sherwood Forest Fishery) 73-3-0. Stoppo’s Lake, Lullington. Swadlincote, Derbyshire, Tues. 12. Carl Ford (Stoppos) 51-4-0, carp and bream, poled maggot; Mick Hawkes (Stoppos) 47-0-0; Dave Kinson (Stoppos) 41-0-0; Mick Phillips (Stoppos) 37-4-0. Sat. 15. Mick Harvey (Stoppos) 51-15-0, carp and bream, poled maggot; John Waite (Stoppos) 36-8-0; John Stevens (Stoppos) 35-2-0; Dave Kinson (Stoppos) 15-4-0. Townsend Lakes, Upwell, Cambs. Sun, 14, Cuckoo Canal. Geoff Arnold (Townsend Lakes) 229-6-0, small carp and tench, poled pellet, peg 19; Steve Hillman (Townsend Lakes) 204-1-0; Brendon Strowlger (Townsend Lakes) 198-13-0. Westwood Lakes, Wyberton, Boston , Lincolnshire , Tues. £1000 Qualifier, Skylark Lake , 29. Mick Stamp (Preston/Sonu Baits) 95-8-0, carp, f1s and barbel, poled pellet; Jon Taylor (Sensas Mark One) 90-0-0; Brian Thompson (Westwood Lakes) 86-2-0; Brian Harding (Maver/Bait Tech) 85-0-0; Dale Wheeler (Westwood Lakes) 81-6-0. Thurs. Over 50s, Skylark Lake , 38. Spike Milligan (Garbolino Lincs County) 102-10-0, carp and barbel, poled worm and caster, peg 32; Bill Whitworth (Lincoln Veterans) 93-10-0; Barry Whitworth (Westwood Lakes ) 89-4-0; Ken Clarke (Westwood Lakes) 87-4-0; Brian Chesterton (Sheffield) 82-4-0. Sun. £1000 Qualifier, Kestrel Lake , 26. 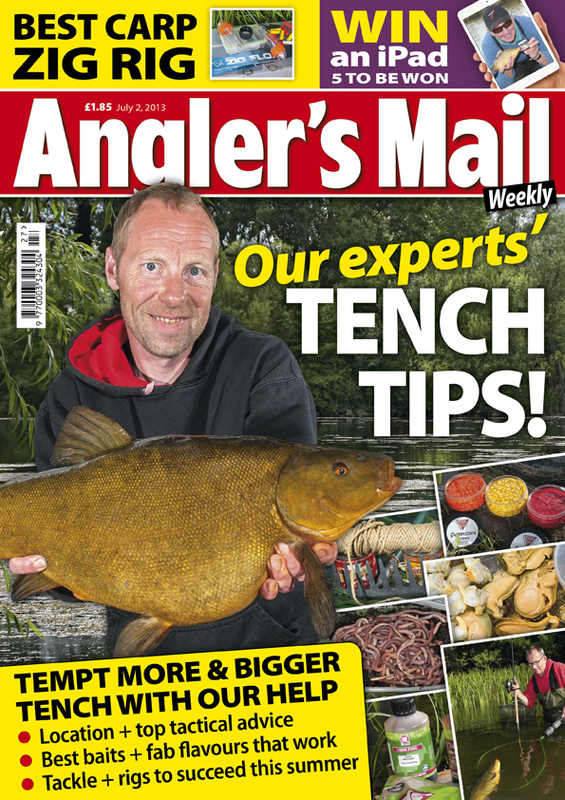 Toby Pepper (Maver/Bait Tech) 120-10-0, carp, pellet waggler, peg 26; Matt Parkin (Nathan’s of Derby) 107-12-0; Sean Higginbottom (Maver/Bait Tech) 73-4-0; Gareth Mills (Spilsby AC) 70-8-0; Gavin Butler (Maver/Bait Tech) 65-8-0.